KCWiT hosted our first event of 2019 at Federal Reserve Kansas City on Wednesday January 16. Over 70 people attended to hear our program directors and leadership recap 2018 and share their plans for the upcoming year. It was a great chance for people who hadn’t been to one of our events before to see what we’re all about. Read below to see what we have planned in 2019! First, Operations Director Ventura Rangel reviewed KCWiT’s successes in 2018. Last year, over 4,500 people registered to our 75 events. We celebrated our 5th birthday and welcomed 34 new leaders! Now we are setting our sights on even further success in 2019. Ventura shared that we have several positions open at KCWiT. Our new Diversity & Inclusion Director Rhia Dixon shared her goals for reaching out to and inviting more communities, including partnering with area schools and increasing the number of our volunteers. Next, founder and CEO Jennifer Wadella shared the successes of CoderDojo, our local partnership with the national CoderDojo program. CoderDojo had an average of 80 kids in attendance and we expanded the number of sessions to two per month. CoderDojo also started a Junior Mentor program in which advanced students take a leadership role in helping the other ninjas with their projects. This coming year, CoderDojo partnered with KC STEM Alliance offering will expand its Junior Mentor program and update its curriculum. Keep up to date with CoderDojo sessions on Facebook. Coding & Cupcakes also grew in 2018! This program is for guardians and their kiddos to learn to code with… cupcakes! We had an average of 60 attendees and 12 female mentors in 2018 and we integrated JewelBots curriculum into our sessions. Attendees programmed their own JewelBot bracelets! In 2019 we’ll continue our JewelBots curriculum for half the year and the other half on web development. If you and your daughter, niece, granddaughter etc. are interested in Coding & Cupcakes, keep up to date on Facebook and Twitter. Then Ventura returned to the stage to discuss our TechTalk events. TechTalks introduce a general audience to topics regarding tech and working in tech. Last year, we hosted panel discussions with people who work in Search Engine Optimization, invited Business Analysts and Data Scientists to talk about their careers. This year, TechTalks will host new info sessions including February’s LinkedIn/Resume help panel with local recruiters and deep-dives into Freelancing and Working Remotely. Keep up to date on TechTalk events by following us on Eventbrite! The last presentation of the night was our Fundraising Director Katie Roby. She shared KCWiT’s ambitious plans for growth including growing our programs, hiring staff (KCWiT is volunteer supported) and establishing a brick and mortar location for our programs. To make these goals a reality, we’ll need more corporate partnerships and support from our members! 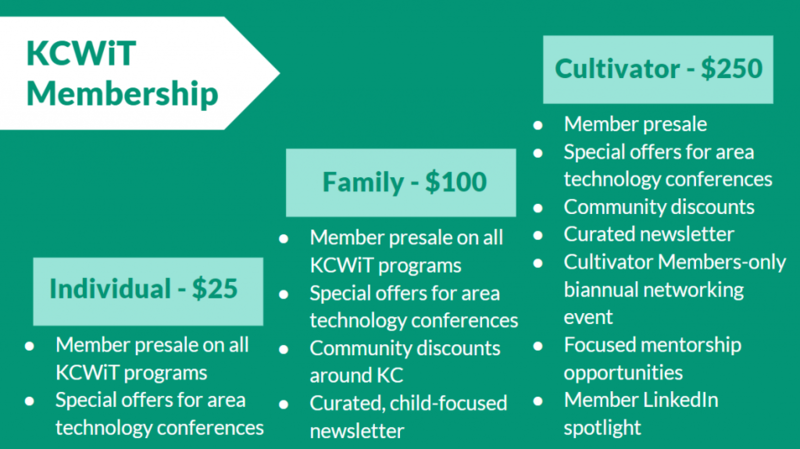 KCWiT is going to launch our stratified memberships, from the individual level to our Cultivator level. If you’re fired up like we are, get involved! KC Women in Technology needs volunteers in each of our programs and in our leadership team. Follow us on Facebook, Twitter, and Instagram for updates. Our next event is February 20th at Cerner Innovations Campus. RSVP on Eventbrite!